Peaceful, woodland walks, river nearby, steam railway. 4 Star accomodation, 5 Star Health award from local authority. Tudor Barn is a grade two listed building set in the beautiful Wyre Forest. The Severn Valley Railway's Arley Station is within one mile, and we are a welcome resting place for walkers on The Worcestershire Way and cyclists on Sustran Route 45. Nearby the Wyre Forest provides un-rivalled woodland walks and wildlife, also the River Severn is within easy walking distance. 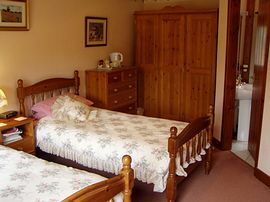 All rooms at Tudor Barn have en-suite facilities, and are non smoking with tea/coffee tray, TV/video, hairdryer, trouser press and clock radio. The views from all the rooms are over our own gardens and paddocks, away to the forest beyond. The early riser may be fortunate enough to see the local deer, and the Barn Owl is sometimes an evening visitor. Bats have made their home here for over 400 years, and are quite happy to share it with us humans! Tudor Barn is a "working" smallholding, having a small herd of Dexter cattle, and a flock of Ryeland sheep. 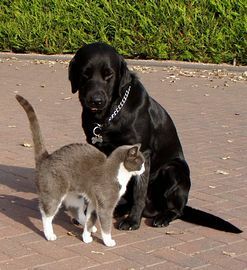 All our animals are accustomed to welcoming visitors; unfortunately we cannot accommodate children of less than 12 years of age, or pets of any age. There is ample private parking for your car at Tudor Barn; bicycles may be stored overnight in a garage. Helicopters may be landed, by prior arrangement. A traditional English breakfast is cooked for you to your requirements. For your evening meal The New Inn, a country pub with a restaurant, is within a few minutes walk and offers a selection of food, beers, wines and often live music. Many other eating places are to be found within a 10 minute journey by car. To see more of Tudor Barn visit our website or even better telephone or email us to arrange an actual visit for yourself. 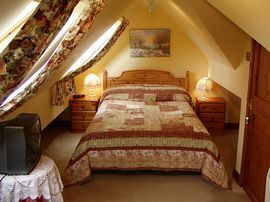 Double Room from £65.00 B & B. Open all year exept Christmas Day. Leave Bewdley on B4194 towards Kinlet. At Button Oak turn right following Tourist Board sign to Tudor Barn. At New Inn public house bear left, Tudor Barn is first on left.